Juuva products contain gentle, natural ingredients that enhance and protect your body’s overall well-being. Based on scientific research, these groundbreaking products are in a class of their own, bringing you better health inside and out. Discover your own inner health and wellness through the power of Juuva products. Juuva currently offers a variety of fabulous products. Each is top in its category because of uniqueness, ingredients or pricing. Juuva is committed to remain cutting-edge in the product line they offer. Each product has its own story. On the Go Whole Plant Hemp Green Drink. A first of its kind, surprisingly delicious, all-natural fusion of full omega whole plant hemp with chlorophyll rich super greens. AN ENERGIZING, NUTRIENT DENSE GREEN DRINK TO SOOTHE, CALM AND FOCUS YOUR BODY AND MIND. Temperature controlled process to preserve the rich source of natural enzymes, phyto-nutrients and vitamins that are native to the plants. A natural source of trace minerals that invigorate the body by turning on key processes and functions. Rich in natural Chlorophyll to detox and nutritionally build your body. Available in the USA only. *FDA disclaimer: The statements above have not been evaluated by the Food & Drug Administration. This product is not intended to diagnose, treat, cure or prevent any disease. The exclusive composition of Juuva’s ALLWATER is designed around a special ingredient. The revolutionary new ingredient responsible for helping raise the pH of water is glycine carbonate. Another revolutionary aspect of this exciting new product is the inclusion of electrolytes. Electrolytes are minerals that conduct electricity in blood and body fluids. In fact, adding electrolytes to water increases its electrical conductivity, a phenomenon that is easily observed by the electrical current that when passed through the treated water will enhance the glow of a light bulb. Electrolyte minerals help control a number of vital functions related to the water levels in the body, including normal muscle function and the relative acidity of the blood. Keeping the right balance of electrolytes in your body guards against dehydration and ensures an adequate amount of fluid in your body. Two of the most important electrolytes are potassium chloride and sodium chloride. Maintaining a proper balance between potassium and sodium is important to good health. The two-ounce bottle with its specially metered dropper top is easy to carry along in a pocket, purse, or bag. Take it along on airplane trips. Engage other passengers by treating water during the flight. Juuva Alka Drops are FAST! Add a few drops, stir, and drink. Quickly treat bottled water in a few seconds by adding a few drops and inverting the bottle to mix it up. There are many documented benefits of alkaline water. Detoxify your body to remove normal acidic waste products accumulated daily, plus remove toxins accumulated in your body from your environment, prescription drugs, and processed foods and from the “normal” process of aging. Acid wastes collected in the body can lead to more serious health conditions. Drinking alkaline water daily can neutralize the acidity and wash acid waste products from cells and tissues. Alkaline water acts as an antioxidant, scavenging for and neutralizing harmful free radicals. Because alkaline water has the ability to give up electrons, it can effectively neutralize and block free-radical damage to the body. Ionized alkaline water seeks out free radicals and converts them into oxygen which your body can use for energy production and tissue oxygenation. Most illnesses cannot survive in an oxygenated, alkaline environment. Alkaline water, as part of an alkaline diet, has a huge impact on your health. Why? Because when you drink the wrong kind of water–water that isn’t Alkaline your body will suffer. It can be filled with toxins, and robbed of essential minerals required for good health. Water that is not good for you can also contribute to premature aging and illness. This product has not been evaluated by the FDA. This product is not intended to diagnose, treat, cure, or prevent any disease. Sodium Hydroxide: separates in water to sodium cations (positively charged sodium atoms) and hydroxide anions (negatively charged oxygen and hydrogen atoms), which ultimately decrease the acidity of the water. Sodium Hydroxide is an electrolyte. Potential benefits of pH 8.8 alkaline drinking water as an adjunct in the treatment of reflux Disease. What Are the Benefits of Drinking Alkaline Water? Potential benefits of pH 8.8 alkaline drinking water as an adjunct in the treatment of reflux disease by Pubmed. Health benefits of drinking alkaline ionized water. The information contained on this site is intended for educational purposes only. It does not constitute medical advice, nor is it a substitute for medical advice. You should consult a physician regarding medical diagnosis or treatment. Juuva will not be held responsible for information provided through external links to other web sites. I love alkaline water. I think better, I feel better, and I know I’m doing my body good when I drink it. Galaxy is my youth elixir. I truly feel younger when I’m on galaxy. Live has replaced many of the over the counter supplements Sue and I used to waste money on. I know I’m now getting five servings of fruits and vegetables, nuts and ancient grains on a daily basis, and it’s much more effective and cheaper than trying to get the same value from the grocery store. Zing is the bomb! Rejuv has truly helped me focus better than ever before. It’s all good!! The Anion Emitter is a Titanium barrel containing 2000 negative ions per square inch, a total of 10,000 in each Emitter. Rather than emitting a ray of anions, the anions in this product permeate and emit a negative charge in all directions, affecting the immediate targeted area for an extended period of time. Anions are negatively charged ions. They contain more electrons than protons, and therefore carry a negative charge. Anions are known to deflect harmful unseen substances that come from the devices and machines we use every day: cell phones, TVs, laptops, gaming systems, and other environmental risks. Negative ions are known to enhance a host of bodily systems including digestion, immunity, lung capacity, circulation, and much more. The healing properties of the Anion Emitter range from improving balance, to restoring health throughout the body and mind. Negative ions are known to enhance the immune system, increase alertness, increase work productivity and concentration. They also reduce susceptibility to colds and flu, relief from sinus, migraine headaches, allergies and hay fever. They have been found to reduce the severity of asthma attacks, increase lung capacity, and stabilize alpha rhythms. Recovery from physical exhaustion or fatigue – by increasing oxygen levels in the blood and facilitating more efficient oxygen utilization, negative ions help accelerate recovery from fatigue. Stabilizing brain function – by promoting abundant oxygen levels in the blood, negative ions help normalize brain function, resulting in relaxation and calmness. Increasing metabolism – by stimulating the exchange of electronic substances in cell walls, negative ions help increase metabolism. Strengthening the immune system – high levels of negative ions promote production of globulin in the blood, resulting in stronger resistance to illness. Balancing the autonomic nervous system – negative ions can calm and relax taut nerves by balancing the opposing sympathetic and parasympathetic branches of the autonomic nervous system. Promoting better digestion – by counteracting over-arousal of the sympathetic nervous system, negative ions help ease tension in the stomach and intestines, promoting the production of digestive enzymes and enhancing digestion. Cell rejuvenation – negative ions help revitalize cell metabolism, enhancing the vitality of muscle tissue and strengthening internal organs. For overall health – negative ions can rejuvenate and revitalize all of the body’s systems and cells, promoting a stronger overall constitution. Ions are invisible particles, either molecules or atoms, which bear an electric charge. When an atom is in a neutral condition, the number of protons (+) and electrons (-) is equal. When the number of protons and electrons is not the same, the particle becomes an ion that is either positively or negatively charged. Generally speaking, positive ions (cations) are harmful to the human body, while negative ions (anions) are beneficial. Positive Ion: an atom (or molecule) that has lost one or more electrons due to a high-energy impact. Natural forces that generate positive ions include the decay of radioactive minerals, radon gas, forest fires, lightning and ultraviolet rays. Negative Ion: an atom (or molecule) that has gained one or more extra negatively charged electrons. Negative ions are naturally generated by evaporating water. Positive and negative ions also exist in our bodies, and the ratio of ions in the air we breathe influences the ratio in our bodies. Ions enter the body through the lungs (inhalation) as well as through the skin – especially through meridian (acupressure) points, which have weak electronic resistance. They then travel through the blood and lymphatic systems to cells throughout the body. Wearing Juuva Enerceutical products may increase the number of negative ions absorbed through the skin. Inside typical residences, positive ions were found to be 500 times more numerous than negative ions. These findings may be due to inadequate ventilation both in office buildings and energy-efficient houses, as well as from the use of electronic devices that generate electromagnetic fields and from building materials that emit formaldehyde and other toxic fumes. On the other hand, high negative ion levels, such as at waterfalls, hot springs and other highly moist areas, will neutralize positive ions, leading to very low positive ion levels. These measurements suggest that it is difficult to maintain sufficient levels of negative ions in the present age. Negative Ions Create Positive Vibes. Effect of Negative Ion Atmospheric Loading on Cognitive Performance in Human Volunteers. Negative ion production from peptides and proteins by matrix-assisted laser desorption/ionization time-of-flight mass spectrometry. Negative Ions – Vitamins of the Air? The Positive Health Benefits of Negative Ions. Positive Is Bad, Negative Is Good. The Science Behind Negative Ions. Negative Air Ions Stimulate Mitochondria. Within both the Anion Emitter and Cation Shield is a proprietary combination of precious stones and minerals, each with unique abilities to consistently target and emit healing properties. Anion: is an ion with more electrons than protons, giving it a net negative charge (since electrons are negatively charged and protons are positively charged). Germanium: Geranium is a chemical element in the carbon group of metalloids. High in antiviral activity, it acts as a powerful antioxidant. Germanium enhances oxygen supply to tissues, and is an analgesic that contains anticancer properties. Germanium may also protect against osteoporosis. Far Infrared Rays: Far infrared therapy is a type of low energy therapy using light in the far infrared spectrum for the treatment of a health problem. Scalar Energy: Scalar energy can regenerate and repair itself indefinitely. This also has important implications for the body. Once the charge is implanted, it remains in place with the regular ingestion of charged products. Scalar energy is also more field like than wavelike. Instead of running along wires or shooting out in beams, it tends to “fill” its environment. This becomes very important in terms of developing the technology for embedding products with scalar energy. Zero-Point Energy: Zero-point energy is the lowest possible energy that a quantum mechanical physical system may have; it is the energy of its ground state. All quantum mechanical systems undergo fluctuations even in their ground state and have an associated zero-point energy, a consequence of their wave-like interaction. Zeolites: Zeolites are microporous minerals that form where volcanic rocks and ash layers react with alkaline groundwater. Zeolite-based oxygen concentrator systems are widely used to produce medical-grade oxygen. The zeolite is used as a molecular sieve to create purified oxygen from air using its ability to trap impurities, in a process involving the adsorption of nitrogen, leaving highly purified oxygen and up to 5% argon. Zeolites are also widely used in industry for water purification. Tourmaline: Tourmaline is a healing stone known to aid in relieving stress, increasing mental alertness, improve circulation, and strengthen the immune system. It is a powerful agent for reducing toxin-related ailments. It is one of few minerals that emit negative ions and far infrared rays. For daily use: Carry the Anion Emitter with you in the car, to work, at home, the gym, or wherever you go. This device constantly emits negative ions, bringing you increased balance and comfort in any setting. Circle the Anion Emitter over an area of the body to reduce discomfort and restore balance. Circle the Emitter over drinks and beverages for approximately 30 seconds to regulate and infuse blueprint frequencies. Repeat this process over any object or system to restore balance and optimum health. Question: Can the Anion Emitter be too much of a good thing for rare individuals? Answer: No. We all need negative Ions and you cannot have too many. When I saw Juuva for the first time I wanted everything (all the products). I didn’t want to do another business but when I found out how easy it was I was in to do more. The emitter is what I tried first. I had chronic low back pain from being a hairdresser for 42 years and standing on my feet. The first few days I didn’t notice a lot of difference but when I helped my daughter clean her house and babysit, the next day I was without back pain. I was so impressed and it continues to help me. I love all the products I have tried. I am a distributor for Juuva. I keep an Anion Emitter on my person all the time because I have, or should say had, back pain. A friend of mine wanted to borrow it for a few days to see how it works for him. Two days ended up being 3 weeks. I had to beg my friend to bring it back because my back pain came back again. When I got my Anion Emitter back the pain went away again. So when I have the emitter the pain goes away but when I don’t have it, the pain comes back. A few months ago I was in a very bad accident that lead to serious spinal pain. It was a nightmare to do anything but afterwards my grandma lent me her emitter and it almost got rid of all of it. Luckily by keeping the emitter on me and only taking it off to wrestle I was able to finish my season. I used to get a lot of neck and back strain when driving for a length of time, so I decided to wedge my emitter (sometimes 2) in the headrest aimed at my neck while I drive and WOW!! The difference it has made when I arrive at my destination I feel a whole lot better. It’s far more effective pointing at my neck, and comfortable than wearing while driving. I love the emitter! My very first experience was the first night we got our emitter. I have a condition called “trigger finger” which causes my finger to freeze and lock in an angled position. This is very painful. I had not been able to straighten it for a few years and was having to have shots in my palm to help relieve the pain. I was also having to wear a finger brace to sleep at night because the pain was so intense. Well, that first night at our meeting I opened the emitter and was just holding it. After about 5 minutes, literally, I noticed my finger was straight! And, the pain had subsided. That was 2 years ago. I have not had any more shots, worn the brace, or had my finger lock in an angle but a couple of times. I know it’s due to the emitter. As someone who used to suffer weekly from headaches, the Anion Emitter has been a lifesaver. I wear the emitter on the back of my shirt, specifically my right shoulder, as that is where my headaches would stem from. Wearing the emitter daily helps to control the pain and I rarely have headaches anymore. The emitter is helpful in so many other ways too. I absolutely love it. I love the Anion Emitter! It helps reduce the pain in my back from a car accident. If I forget to wear the emitter on the back collar of my shirt the pain returns within a few hours of activity. I never go without an emitter on my back shirt collar. I love to go walking. I would walk a set distance every morning. One morning I felt out of breath and was having a hard time walking the distance I had covered easily in my previous trips. I suddenly realized that I was not carrying the Anion Emitter. I had left it at home. Since that time, I never go walking without my emitter. The emitter does give me additional energy as well as eases pain. I love and appreciate Juuva’s Anion Emitter! The first time I used it, the pain in my joints vanished, except for my left hip, which mostly vanished as I clockwise circled with the Anion Emitter. Then I shared the Anion Emitter with two friends who both had great back pain. After a while both men had no back pain. One of these friends had severe back pain for 10 years. I cried for joy that they both don’t have back pain, even to this day, after they faithfully acquired and use it daily. While on vacation in San Diego I hit my thumb with a mallet. After bandaging the wound I kept the emitter on it for about 30 minutes or so and the throbbing and pain was gone. In about 5 days it healed completely. I had someone take the emitter around my hip it really did work and I couldn’t believe it. My favorite Juuva product is the Anion Emitter. I experience a subluxation in my neck every day. Once in a while I experience extreme stiffness in my neck that doesn’t enable me to move it to the left or to the right without a lot of pain. I took my emitter and rubbed it on the back of my neck and a few minutes later I noticed my neck felt 100% better. I was able to turn it to the left and to the right without the horrible pain and stiffness that I was experiencing before I rubbed the emitter. I have a lot of stress and tension that I hold in my neck area and I used to “crack” my neck every day (sometimes several times a day depending on how I slept the night before.) But now I rub my emitter on my neck every morning before I clip it to the back of my shirt and I’m good to go! I had an accident back years ago when i was younger and it put pressure on my collar bone and my spine. I was 3 years getting work done on it to get it put together. I was told that when i got older it would come back to haunt me. It was beginning to do that pretty good style. I had reached a point where the only way I could look to my left was to turn my whole shoulder. I went to a meeting and I was given the emitter to try and it took about a half an hour to 45 minutes to start releasing but it still pulled some. I kept trying a little bit longer and by the end of the meeting I could look to my left with out moving my whole body. I can still do that today because of the emitter. BioIntense anti-aging skin care is quite simply the most effective way to visibly diminish the signs of aging. Utilizing our exclusive proprietary formulation, Juuva extracts essential organic nutrients that are rich in antioxidants, vitamins, and minerals, and combines them with essential skin hydrating emollients that stimulate and penetrate your skin at a cellular level. This luxurious cream is clinically formulated to diminish fine lines and wrinkles, all while hydrating, toning and tightening the skin. The BioIntense formula restores collagen and reduces the effects of free radicals through a multi-faceted exfoliating and moisturizing process. Experience the dramatic effects of revitalized soft, supple skin with Juuva’s premium anti-aging skincare cream. Gently moisturizes and refines skin surface with daily use*. *The information contained on this site is intended for educational purposes only. It does not constitute medical advice, nor is it a substitute for medical advice. You should consult a physician regarding medical diagnosis or treatment. Juuva will not be held responsible for information provided through external links to other web sites. 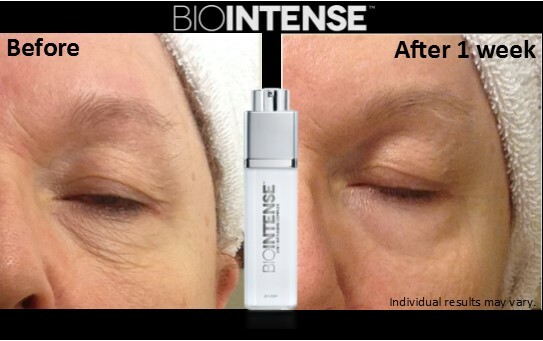 Bio-intense has greatly reduced the wrinkles around my eyes and on my forehead. One of my distributors who is an esthetician, saw me a month after seeing our presentation and she said “your skin looks good. Are you using the face cream? I was and I am. Many compliments and people thinking I am in my early 50’s not my mid 60’s. I am a masters crossfitter/weightlifter, and I would like to share my experience with the Biointense cream… after a competition workout that consisted of 75 pull-ups, and by the end of the workout, both of my hands were torn to shreds and very painful. I was given a sample of Biointense by Lisa Flurry who also works out at our gym and in a matter of 1 to 2 days the smaller rips were almost completely healed, but the large one on my left hand took a little bit longer to heal and a few more applications, but after 3 to 5 days, the large rip healed completely and left no scars on my hands. I am totally hooked on this face cream and use it everyday now on my face and will use it again on my hands…thanks for making such a wonderful product! I love the Biointense. Not only how it makes the wrinkles disappear – but it helps with the sunburn. Within a few hours, the red burn is gone. Thank you Juuva. I used the Biointense for 2 weeks, from day one I noticed a smoothness in my face. The skin on my face felt so much more fresh than it did before. I really liked how the Biointense felt on my face. One day I woke up and saw wrinkles on my upper lip. Started using Biointense and 1 month later that little wrinkle and others were gone. Awareness is growing that we live in a world where devices that emit harmful EMF’s (Electromagnetic Fields) are all around us. One of our core objectives at Juuva is to combat this increasingly dangerous threat. The Cation Shield™ helps strengthen your body’s bio-field while bathing you with the beneficial effects of negative ions to help combat EMFs. The Cation Shield protects you from the rigors and dangers associated with EMFs produced by everyday electronics. The Cation Shield actually transmutes and neutralizes dangerous positive ions to beneficial negative ions. We all want to live a healthier, happier, longer and more vibrant life. Unfortunately, it is growing more and more difficult to meet that objective. With all of the technological advances over the past century we are literally creating interference that threaten our health and wellbeing. Negative Ion: an atom (or molecule) that has gained one or more extra negatively charged electrons. Negative ions are naturally generated by evaporating water. Positive and negative ions also exist in our bodies, and the ratio of ions in the air we breathe influences the ratio in our bodies. Ions enter the body through the lungs (inhalation) as well as through the skin – especially through meridian (acupressure) points, which have weak electronic resistance. They then travel through the blood and lymphatic systems to cells throughout the body. Wearing Juuva Enerceutical products may increase the number of negative ions absorbed through the skin. For daily use: Simply attach the Cation Shield to your cell phone, laptop, television, microwave, or any device that may emit electromagnetic fields. Question: Can the Cation Shield be moved and used on a different electrical device after it has been installed on the initial device? ie: If I purchase a new cell phone can the shield be effectively transferred from the old phone to the new one? Answer: The Cation Shield is a round patch. You peel the paper covering from the adhesive on the back and stick the patch on your phone or appliance. You may have to apply some additional adhesive (not included) if you move the patch to another device but, when care is used, the patch will not be harmed by transferring it as desired. This is a multiple product testimonial. I’ve had a bad back and hips almost all of my life. After being introduced to the Juuva products, the Anion Emitter and Cation Shields, I have had a major transformation. I wear an emitter on each hip every day and I also have a Cation Shield in each shoe. The emitters help to relieve the inflammation in my hips and legs. About 4 years ago I was told I had nerve damage in my feet. I would get a tingling feeling, especially after being on my feet all day. After putting the Cation Shields in my shoes the pain/tingling feeling has gone away. They have been lifesavers for me. I have an unusual application for the Cation Shield. I have a lot of pain in my right knee. I placed four Cation Shields in a knee brace around my kneecap. After two weeks the pain in my knee has greatly decreased and I barely notice it. I wear the knee brace 24/7 and the Cation Shields have made a huge difference in the pain I feel. Recently I had a bad fall twisting my ankle severely. I learned from an acupuncturist master at the Vision Event how to use the Cation Shields on the injury with surgical tape. My extremely painful injury immobilized me but within one hour of applying 3 Cation Shields, almost beyond belief, the pain and lack of flexibility was gone! Thank you Juuva for such amazing products that really work! Thank you Summit for Vision & great events with powerful speakers, doctors, and scientists where we are able to learn skills and information that allows us to grow and transform our lives, our very futures. One pitcher that does it all. Power of Negative Hydrogen – Negative Hydrogen is known as the king of antioxidants because of its unique ability to fight free radicals without harming the body. The problem with most antioxidants is that when they neutralize free radicals, they become free radicals themselves—and although they are not as harmful as the original free radicals, they still aren’t an asset to your body. For example, vitamin C becomes dehydro-ascorbic acid after eliminating a free radical and must be eliminated by the body. The opposite is true of active hydrogen—when it neutralizes a free radical, the result is pure water. H- ions can re-store and re-cycle all other radical scavengers. That is, it can restore antioxidants, like vitamin C, to prevent them from becoming toxins. *The statements contained in this material have not been evaluated by the Food and Drug Administration. Juuva products are not intended to diagnose, treat, cure or prevent any disease. Has a simple and convenient easy-fill lid. Comes with a Use Indicator to track the life of your filter. Contains a replaceable filter which will filter approximately 732 liters of water. Kelly Ripa’s High-Alkaline Cleanse: What’s Behind the Latest Diet Trend? Health Benefits of Alkaline Water. Question: Why is Alkaline Water good for your health? Answer: Alkaline water neutralizes the accumulated acidic waste in the human body and washes away the accumulated waste thus helping blood circulate. Question: Why should I drink Alkaline Water? Answer: There are many benefits to Alkaline Water. First and foremost, it is a powerful antioxidant which they helps with neutralizing free radicals. Free Radicals damage causes us to age and causes diseases. Alkaline Water balances our bodies’ pH. Our diet is often extremely acidic. Soft drinks, fast foods & processed foods deposit acid waste in our bodies that builds up over time and creates an ideal environment for diseases of all kinds to thrive. Maintaining an alkaline helps us maintain an environment in our bodies that is not conducive to diseases. It may take years depending on how acidic your body is, but Alkaline Water, because of its properties, will flush acid waste from our bodies. Question: How does Alkaline Water taste compared with conventional water? Answer: A common remark regarding the taste of Alkaline Water is that it tastes smoother and sweeter than conventional water. This is because of the molecule cluster size and shape. Since it is small and regular shaped, it feels smooth because it is. It also does not fill you up and bloat you the way conventional water can do if you drink a lot of it at once. Question: What should I expect from drinking Alkaline Water? Answer: Alkaline Water provides your body with lots of oxygen, which is why it gives us energy. Alkaline Water is much smoother tasting than conventional water. It makes better coffee, tea, juice, etc. Alkaline Water is wonderful to cook with because it helps hydrate the food and bring out its natural flavor. However, other changes in your body after drinking Alkaline Water will be much more subtle and will take some time. If you have accumulated acid waste in your system, it probably took years for your body to get into that condition and it will take some time to reverse it. As the body is slowly brought into a healthy pH balance by drinking Alkaline Water, it will naturally begin to function more efficiently and problems will begin to correct themselves. Alkaline Water can help bring your body into a healthy pH balance naturally by providing your body with oxygen through alkalinity so it can heal itself. Question: Does alkaline water help to lose weight? Answer: Alkaline water is not a diet medicine. However, there are many testimonies saying they lost weight while drinking Alkaline Water. The reason is Alkaline water neutralizes the fat and converts solid fat to liquid fat. Alkaline water neutralizes the fats in our body, turns them into liquid state and excretes them. Basically Alkaline Water is like soap it washes away the wastes in body. Question: I drink bottled water is it not as good as alkaline water? Answer: The health “benefits of alkaline water” are that it’s not acidic water. Most of the bottled waters people buy like Dasani and Aquafina are, in fact, acidic. They have been purified through a filtration system called reverse osmosis or distillation, leaving them stripped of all the alkaline minerals, oxygen, and antioxidants that were once there. This acidic water is still better than soda or high sugar beverages, but the fact that it is empty and acidic water means that it is oxidizing to your body. Think rust. If you drink acidic water for too long, it will leach minerals and nutrients from your body! I love the Energy Pitcher C7! I am much more hydrated and feel a lot better when I am drinking the water from it. It is so smooth and tastes so good. I love that I am providing great water for my family. Thank you Mr. Grant Pace for providing a product that is first class in its category. I drink water from my pitcher every day. I was recently gone from home for 4 days. Boy did I miss my Juuva water! The water I drank did not taste good at all. I was thirstier too. I love my Energy Pitcher C7 and Juuva water. The pitcher is my favorite. I tried to drink all the water I should from my Energy Cup, but I didn’t always shake my water all the time. With the pitcher I am drinking all the water I should and it’s all the best water available. I have noticed a dramatic lessening of my pain in my hands. I also don’t have to get up several times during the night to relieve my bladder. I have also noticed an overall sense of well-being. I attribute all these positive health changes to the pitcher and all the water I’m drinking. Energy Pitcher C7 – best in the world – solves the problem when company comes or family visits. I love the Energy Pitcher C7. It is so easy to use. The best it has done for me is keeping my digestion in balance. I had acidity so bad that it was burning my face to a point my face was so raw (very little skin left). Now have a clear face. I also must have the Allwater with me at all times so I can keep the acidity in check. Which is a must for me. My new favorite product from Juuva! The Energy Cup I carry with me everywhere and drink from it often, but when I am home, I can now get all of the same benefits from the Energy Pitcher C7 by just grabbing it from the fridge and pour. Most importantly though all of my grand kids are now getting the alkaline, ionize, magnetized and energized every time they go to the fridge. My whole life I have struggled drinking regular unflavored water, even understanding all of the health benefits I had trouble choking it down. I’d gag unless there was a slice of lemon, lime, or something to alter the flavor. The Juuva Energy Cup has dramatically changed everything about my experience with water and how much I consume daily. With the introduction of the Energy Pitcher C7 I am truly amazed at the positive impact using it to convert my water to purified, alkalized, ionized, and magnetized water is making in my life. I feel so much better, more alert and energized it is remarkable. Without a doubt it produces the best tasting, smoothest, most healthful water on the planet! I love it and its ease of use. Now i can’t wait to drink more water as long as it’s from the Energy Pitcher C7. *The statements contained in this material have not been evaluated by the Food and Drug Administration. The product I love is the Alkaline Water. Before I was on the water I had severe back pain, my back was frequently in painful spasms, along with my leg. I also had a problem with drinking water. I did not have a thirst, and when I did drink, my stomach didn’t feel good, kind of sick. So, I didn’t drink water very often. When I started drinking the water it did not bother my stomach, in fact, it felt very good in my stomach – that was the Energy Cup. The pitcher experience was even better. The spasms have long since stopped along with my back muscles being so tight and painful. So I love drinking water – the more I drink the more I like water! Using the Energy Cup was an experience that helped my body to hydrate and allowed it to heal itself. It was eliminated my prescription medication, given me more energy, and given me a better life. Drink. Nourish. Feel the Impact. Juuva’s Galaxy High Impact Blend is a delicious, multi-dimensional approach to attaining and maintaining optimum health. Our proprietary synergistic blend contains a multitude of nutritious bioactive ingredients which scientific studies prove to be the most efficacious nutrients found throughout the globe. Galaxy’s High Impact Blend exotic natural ingredients come from the world’s most ancient and highly acclaimed Superfruits and Superfoods, each providing vitamins, minerals and nutrient-rich antioxidant properties essential to a healthy lifestyle. For centuries, these unique components have been revered for their healing powers and youthful properties that help repair, rebuild and restore optimal health and well-being through their unique holistic benefits. Galaxy’s powerful blend exhibits a high amount of antioxidant activity that offers a number of benefits. The antioxidant capacity is higher in Galaxy than in 21 of the 22 highest antioxidant fruit juices listed by the USDA (Haytowitz and Bhagwat, 2010). Superfruits Acai, Pineapple, Red Grape, White Grape, Pomegranate, Red Raspberry, Acerola, Aroniaberry, Elderberry, Cranberry, Goji, Mangosteen. Superfoods Barley, Acai Oil, Cayenne Pepper, Flaxseed, Buckwheat, Alfalfa Sprouts, Lactobacillus, Soy Isoflavones, Garlic, Wheatgrass, Green Tea Extract, Garlic. Drink approximately 1 ounce (25ml) of Galaxy High Impact Blend each day with breakfast for an invigorating and energy-filled day. For afternoon energy, one additional ounce will dispel the late afternoon slump. Do not exceed the recommended amount. Galaxy High Impact Blend contains only natural ingredients safe for general use. However, if you experience any adverse reactions, discontinue using the product immediately. Question: Are there any artificial colors or preservatives added to Galaxy High Impact Blend? Answer: No. Galaxy High Impact Blend contains no artificial colors, preservatives or sweeteners. It does not contain high fructose corn syrup, and the sweet taste of Galaxy High Impact Blend is completely natural. Question: Is there caffeine in Galaxy High Impact Blend? Answer: Yes. Galaxy High Impact Blend includes Green Tea Extract which is a naturally occurring form of caffeine. No artificial caffeine has been added. Question: What is the expected shelf life of Galaxy High Impact Blend? Answer: Galaxy High Impact Blend has a complete two year shelf life for sealed bottles, however it should not be subjected to extreme hot or cold temperatures. Galaxy High Impact Blend is aseptically filled to ensure this nutrient rich product is entirely bacteria free prior to sealing and ensures a long shelf life. Question: How long can an opened bottle of Galaxy High Impact Blend remain fresh? Answer: Galaxy High Impact Blend needs to be refrigerated after opening, which will maintain its nutritional efficacy and taste for up to 90 days. Question: Is there a reason we have changed the caps on Galaxy? Answer: Yes! Galaxy will now have a metal cap that is crimped in place during the bottling process. This will provide improved protection against leakage and breakage. Question: What is the sediment or froth in Galaxy? Answer: Sediment at the bottom of the bottle, and any froth accumulated in the neck of the bottle, is completely normal. These are actually part of the Superfruit and Superfood blends. Simply shake the bottle vigorously prior to use so as to fully benefit most Galaxy’s unique formula. Question: Why does Galaxy taste different from time to time? Answer: Based on the season harvested, exotic fruit blends can vary between a slightly sweet to a slightly sour flavor. However the premier nutrient attributes and efficacy of each ingredient remains consistent, regardless of any variances in flavor. Although the seasonal batches may have a unique variation in flavor, we test each batch to ensure it delivers the proper nutritional balance with minimal sweeteners to ensure the safety necessary for diabetic use. Influence of Mixed Fruit and Vegetable Concentrates on Redox Homeostasis and Immune System of Exercising People. Effects of probiotic Lactobacillus acidophilus and Lactobacillus casei on colorectal tumor cells activity (CaCo-2). The clinical use of HMG CoA-reductase inhibitors (statins) and the associated depletion of the essential co-factor coenzyme Qlo; a review of pertinent human and animal data. The Effects of Cayenne Pepper on the Body. Pomegranate as a functional food and nutraceutical source. ARTHRITIS – THE CLINICAL EVIDENCE THAT POMEGRANATE MAY SLOW THE PROGESSION OF ARTHRITIS. Since I have been using the Galaxy and the emitter for the last couple of months, it finally dawned on me that I haven’t had a headache. I was used to having a headache at least once a week and didn’t go anywhere without my medication. So it has been great. I have used Cation Shields on the bottom of my feet and on my ankles, I was amazed at the relief that it gave me. I have pain in my feet and ankles continually so it was great to have relief. Galaxy is the best life insurance. Combined with the alkaline water from the pitcher, I have confidence in my overall health. Being hydrated is an amazing health benefit – #10 alkaline water from the pitcher corrected a physical condition I’ve had for “50 some” years! I am now on nearly 4 years of drinking an ounce per day of Galaxy. Simply stated, I have enjoyed cold and flu free health for that entire period. Maybe it’s a coincidence, but I have never had that health history in any 4 year period prior to this in my life. I recently spent several days in Utah (I’m from Idaho) attending to a sister in the hospital. Because of the uncertainty of a refrigeration source, I did not bring my Galaxy with me. As a result, I feel I was exposed to several different illnesses and ended up catching some. I’m sure my immune system was down so I was very susceptible to disease. I will, in the future, bring Galaxy wherever I can so I can receive its benefits. I drink it every day and more often if I am not feeling very well. We recently left home quickly in an emergency and were gone for 4 days. We didn’t take our Galaxy. Boy did I feel it! I was achy and sore, really hurting. I was so glad to get home to my Galaxy! What a difference it makes. I appreciated it more when I was without it for several days. With the ongoing demand from work I am always on the move. Always helping people and being pulled in different directions. I start my day with a Juuva cocktail and drink it throughout the morning and afternoon. Taking the Rejuv in the afternoon keeps my mind and body going for all of the other meetings and events of the evening. Thank you Juuva for all of these amazing products. Recently I went to Disneyland and I was so thankful for the travel packs. I went with 3 little girls and their parents and grandparents. Walking around all day for 3 straight days will take its toll on anyone. Having the travel packs with me meant I could take my Galaxy any time without worrying about it being cold or measured without having to go back to the room. It made such a difference in my energy and the pain I normally feel in my feet. ORAC Rich Berry & Fruit Blend (30): Purple Grape*, Noni Fruit, Acai Berry, Mangosteen, Wolfberry-Goji, Raspberry*, Black Currant, Blackberry*, Blueberry*, Hawthorn Berry, Pomegranate, Bilberry, Cranberry, Elderberry, Whole Purple Grape, Strawberry*, Acerola Cherry, Cherry*, Orange, Watermelon*, Papaya, Lemon, Grapefruit, Peach, Prune, Plum* and Pineapple in a base of Apple, Pear, and Banana. Nutrient Rich Vegetable Green Blend (30): Barley Grass juice powder*, Alfalfa Leaf juice powder*, Wheat Grass juice powder*, Carrot*, Beet*, Oat Grass juice powder*, Dunaliella, Kelp, Spinach*, Sweet Potato*, Dulse, Klamath Lake Algae*, Chlorella, Spirulina, Broccoli*, Kale, Tomato*, Squash, Cabbage, Cauliflower, Bell Pepper, Parsley, Cucumber, Brussels Sprout, Onion, Celery, Garlic, Cayenne, Asparagus and Ginger. Omega Rich SNS Blend (11): ** Flax Seed, Oat Bran, Brown Rice Fiber Complex, Almond Seed*, Sunflower Seed, Chia Seed, Quinoa Sprout*, Amaranth Sprout*, Wheat Sprout*, Pumpkin Seed, and Sesame Seed. Enzyme Rich Mineral Blend (83): Amylase, Cellulase, Protease, Lactase, Lipase, Maltase, Bromelain, Sucrase, Ionic Fulvic Mineral Extract Powder, Superoxide Dismutase (SOD), Aloe Vera Leaf Extract and Yucca. Vital Probiotic Blend (22): Lactobacillus acidophilus, Lactobacillus casei, Lactobacillus rhamnosus, Bifidobacterium bifidum, Lactobacillus sporogenes, Lactococcus lactis, Lactococcus cremoris, Lactobacillus delbrueckii, Lactobacillus kefir, Leuconostoc cremoris, Lactobacillus caucasicus, Lactobacillus plantarum, Lactobacillus salivarius, Lactobacillus bulgaricus, Lactobacillus helveticus, Lactobacillus paracasei, Lactobacillus brevis, Bifidobacterium infantis, Bifidobacterium lactis, Bifidobacterium longum, Bifidobacterium breve and Streptococcus thermophilus. Other Ingredients: Natural Mixed Berry flavor, Silicon Dioxide, Guar Gum, Xanthan Gum, and Stevia. Add 8 ounces of water to Live and shake vigorously to unleash the power of Live’s nutrient-rich, whole food blend. 10 grams of Live a day provides the equivalent of five servings of raw whole fruits and vegetables. What Does Wheatgrass Do in Your System? A study on wheat grass and its Nutritional value. Health benefits boost sales of broccoli sprouts. To stay healthy, eat an onion a day. Raw Oats for Gastrointestinal Health. A Scientific Review of the Health Benefits of Oats. Bioactive peptides in amaranth (Amaranthus hypochondriacus) seed. What are the Health Benefits of Eating the World’s Healthiest Foods? Why Should We Eat Whole Foods? Vegetables and Fruits: Get Plenty Every Day. Why do you need to eat vegetables everyday? Can eating fruits and vegetables help people to manage their weight? Seven Reasons Quinoa is the New Health Food Superstar. Study: Eat 7 servings of fruit, veggies daily. Compelling statistics show the importance of fruits and vegetables. I love to have Live before I work out. I have had decreased muscle pain and can work out more intensely. I have increased energy and less exhaustion after I am done. All my life I suffered with extreme stomach acid discomfort and heartburn. I started drinking Live in alkaline water after the February 2014 Juuva convention. Within 2 weeks, my stomach discomfort was gone! Since then, I have not had any discomfort when I start my day. With Live, I take it every single day. My favorite is the Live. When I first got on all products I tried one at a time to see what happened. I am a massage therapist for 20+ years and have struggled with pain in my hands and numbness. The water helps quite a bit but the Live was the one that was consistent with taking the pain out. If I took a packet in the morning the pain would go away and if it came back in the day I would take another packet and it would leave. I still will have the same result. Some days I need only one, but every once in a while I need 2 and I know it will knock it out! I love alkaline water. I think better, I feel better, and I know I’m doing my body good when I drink it. Galaxy is my youth elixir. I truly feel younger when I’m on Galaxy and the peace of. Live has replaced many of the over the counter supplements Sue and I used to waste money on. I know I’m now getting five servings of fruits and vegetables, nuts and ancient grains on a daily basis, and it’s much more effective and cheaper than trying to get the same value from the grocery store. Zing is the bomb! Rejuv has truly helped me focus better than ever before. It’s all good!! Mix well in a glass container (do not mix in energy cup). Chill to desired temperature. Drink after your morning meal has begun to digest. (Approximately two hours after eating). 3/4 cup milk (whole milk, 2%, 1%, or skim, it does not matter) may need more milk depending on how much ice cream is put in blender. Blend together in blender until smooth, pour into glass and enjoy. This makes 2 (24 oz.) shakes or can be divided up into smaller portions. This is a tasty treat for your whole family. If you experience a lack of energy or occasional fatigue due to an active lifestyle, want a natural “edge” to go that extra mile, or need a pick-me-up to buckle down at work the advanced nutrients in Rejuv may help you feel energized and alert. So the next time you want to gulp a cup of coffee or a can of soda, reach for Rejuv instead! Experience 6-9 hours of crash free & jitter free energy and a healthier you. Rejuv contains natural sources of caffeine so you will not feel jittery. Now you can escalate your energy anytime you want without worrying about unwanted side effects. * Receive natural energy from Rejuv’s unique ingredients. Organic Wheat Grass: one of the ingredients with major benefit in wheat grass is chlorophyll, which has the ability to draw toxins from the body like a magnet. Considered the “blood of plants”, chlorophyll can soothe and heal tissues internally. For daily use: Receive 60 packets containing 3 capsules per packet. Enjoy 1 to 3 capsules with a large glass of water. Ashwagandha Leaf Derived Withanone Protects Normal Human Cells Against the Toxicity of Methoxyacetic Acid, a Major Industrial Metabolite. Scientific basis for the therapeutic use of Withania somnifera (ashwagandha): a review. I love that Juuva offers a product that is all natural, good for you, and gives you a long lasting smooth energy. Rejuv lightens my mood and gives me an energy that is much needed when that 2 o’clock slump hits. I love that I can choose between 1, 2, or 3 pills depending on how much energy I need at that moment. It is such a better product then what you can get in convenience store. I have had so much success with the Rejuv. This product gives me energy as well as helps me focus better while I am at work. As a caregiver I need what this product offers. Rejuv is my employers’ best friend and they don’t even know it. Rejuv keeps me focused at a very tedious job. I read medical records on a computer for 8 hrs a day, easy to lose focus. I take Rejuv about 9 am and I can go through the workday with much more productivity for my employer. Rejuv!! I service snowstorms. I have plowed for 24 hours. Taking the Rejuv has kept me alert, sharp and the energy to keep on going. At 64 years, I am keeping up with guys in their 20’s and 30’s. Yesterday we cleared roofs all day. It has no ups or downs and works. I love the mental alertness that I get when I take Rejuv. I don’t sleep a lot and sometimes during the day when I feel the need to keep up the energy and don’t have the time for a 15 minute power nap, I take the Rejuv. Personally, I can take it even late in the afternoon or evening and if it is time to hit the sack, I can still fall asleep easily. I keep a packet with me always. Rejuv excels at 2 things – giving you a good 6 hours of energy and helping to improve my mood at the same time. I love Rejuv. I’m a little sensitive to caffeine and it can give me headaches and then you have that lovely energy crash. I love that I don’t have any negative side effects with Rejuv. I love the clear energy of feeling good and the focus it gives me. TRUSILVR is the most effective tool to maintain, sustain and support your immune defenses by reducing the work load placed on your immune system. This support allows your immune system to focus and prioritize its efforts on regeneration and overall wellness. TRUSILVR creates an environment that makes it impossible for pathogens to survive and multiply. Helps maintain a healthy digestive environment and it maximizes the amount of nutrients that the body is able to extract from food. Promotes healthy cell growth and fend off foreign invaders. TRUSILVR is the most usable form of an effective germ fighter. TRUSILVR a truly safe, natural remedy for many of mankind’s ills. When the possibility of germ exposure is higher, TRUSILVR can be taken orally each day or applied topically when there is a skin problem. It’s like having a second defense system. TRUSILVR can be used as a topical antiseptic for minor burns. Purified Silver – is a metallic silver that has been subjected to the refiners fire enough times to burn all gross and contaminants out leaving a pure silver that can conduct electromagnetic currents without resistance. Purified Water pH Plus Buffer system – Purified water begins as a steam and we collect the condensing drops that are free of dissolved solids. Then the pure water can be given a frequency and/or magnetic signature that conducts the proper type of electromagnetic frequency through the silver rods so one molecule at a time the silver can be deposited into the water where it will be permanently bonded in crystalline structures that transfers silver energy. Question: What does TRUSILVR do? Answer: TRUSILVR may have the ability to destroy bacteria, viruses, mold, yeast, and a limited number of parasites. It also can purify water. Question: How Does TRUSILVR Work? Answer: TRUSILVR works in numerous ways but we will focus on the most common mechanisms of action: As a silver oxide, viral disruption and resonance. As a Silver oxide it will remove an electron from the bacterial membrane thus rupturing the pathogen and destroying it. As a viral disruption it can bind with the charged, incomplete genetic viral molecules preventing viral replication thus rendering the virus unable to duplicate itself. As a resonant frequency. This is a germicidal frequency which can destroy bacteria, viruses and mold. Answer: TRUSILVR is produced in extremely low parts per million (5-40 ppm) and has never even been identified as a potential for problem in the water treatment plants or in the environment. This is significant because the EPA has a rating for toxic spills. This identifies the amount of a compound that would cause a toxic event. For instance, Clorox would qualify as a toxic event if 3 gallons were spilled. In contrast, The EPA would require a spill of 12.5 million gallons of Silver liquid in order to be classified as a toxic event (5). This would require spilling the entire contents of 12.5 oil tankers at one time in one place without any other water to dilute it. There is no consumer or combination of consumers that store this much silver anywhere in the world. Question: How Much TRUSILVR Should I Take? Answer: Most people will want to take two teaspoons twice a day and if they get sick they will want to take two tablespoons twice a day. Question: Will I Turn Blue When I Take TRUSILVR? Answer: No-Nobody has turned blue from the new silver technology. Ionic and colloidal silvers of the past have caused the blue man coloring because they use a different and much higher concentration of homemade silver. The Environmental Protection Agency has rated this newly patented Silver and given it a safety rating. In order for Silver to be considered to be a toxic spill there would have to be a spill of 12 million gallons of Silver liquid. This is in the lowest risk category. There have only been 30 people in the past thirty years that have turned blue, and these all used their own home made silver brew at an extremely high concentration. Question: Who Can Take TRUSILVR? Answer: Anyone can take TRUSILVR, but the children under 75 pounds should take half the adult doses. And children younger than one should take one-third the normal adult dose. By the way, the normal adult dose of the silver liquid is 2 teaspoons twice a day. Question: What Scientific Research Exists to Back Up the Health Benefits of Silver? Answer: There are over 180 scientific studies from independent sources like universities, hospitals, research institutions and nursing homes. Publications in medical journals, textbooks, medical newsletters, and other studies document the benefits and safety of Silver liquid. Question: Should TRUSILVR Be Used Daily or Just When I Have a Problem? Answer: TRUSILVR is designed to be used daily to aid with better overall wellness. It can be taken 2 teaspoons twice a day or as needed as a topical. When a person has a more dramatic need they can double this dose, and in some severe cases people have successfully taken 4 oz. per day for up to two weeks. Question: How Does TRUSILVR Support Immune Function? Answer: TRUSILVR benefits the immune system directly by moderately improving the number of immune cells that are capable of surveying for disease and destroying foreign pathogens. TRUSILVR benefits the immune system indirectly and may aid in destroying the bacteria and viruses the cause various ailments thus reducing the workload from an already overworked immune system and allowing the immune system to refocus its energies and recharge. Question: Are There Any Contraindications Using TRUSILVR with Any Prescription Products? Answer: Don’t mix TRUSILVR with salt. The chloride binds with the silver and removes the silvers benefits. Beyond the neutralizing effects of salt, there are no contra indications other than don’t take it with salt. The salt inactivates the silver. If you are worried or concerned take the TRUSILVR one hour before your medications or foods. Question: How Long Does TRUSILVR Stay in the Body, Can It Accumulate Over Time? Answer: Research suggests that 98% of the silver leaves the body by the next day. Argyria, a condition caused by inappropriate exposure to chemical compounds of the element silver, can occur when the silver stays in the body, but you would have to drink a ten times normal dose for decades (and none of it could leave your body) before you would begin to have symptoms of Argyria. It is the ionic and colloidal silver users that have too high concentrations of silver that cause Argyria. Question: Is it Better to Take TRUSILVR with Food or on an Empty Stomach? Answer: TRUSILVR can be taken either way. If you take silver on an empty stomach, there will be less salt to interfere with and if you take it on an empty stomach you will absorb the silver about 15 minutes faster than if you take it with food. Question: Is TRUSILVR a Nutritional Supplement, Food or Drug or Something Else? Answer: TRUSILVR is a nutritional supplement that passes through the body unchanged. Question: Does TRUSILVR Require Refrigeration or Any Other Special Storage… How Long Can I Store It? Answer: TRUSILVR can be stored for 8 years. It does not require refrigeration. It can be frozen or boiled and return to normal function. Question: Does Silver have a long history? Answer: Silver has historically been used to support your body's natural immune system ability to respond to unfriendly microorganisms. American settlers put silver coins in milk to help keep it fresh; in the 1930's, American physicians relied on silver. Today, silver is used in bandages and salves, and even put into newborn eyes. These traditional uses or FDA approved OTC (over-the-counter) uses of topical silver are not to be confused with ingesting nano particle silver to supplement the diet. When you use TRUSILVR, you are feeding your body to support overall health. TRUSILVR may be your most effective tool to help maintain, sustain and support your immune defenses, because it reduces the workload placed on your immune system. This support allows your immune system to focus and prioritize its efforts on regeneration, wellness and prevention, rather than always suffering a health crisis. Respiratory Health: Swallow two teaspoons twice daily and spray 3-4 sprays in nose as needed. Nasal Health / Allergies: Swallow 2 teaspoons twice daily and spray into the nose 3-4 sprays 4 times a day. Mouth and Gum health: Hold 2 tablespoons in mouth and gargle for 4-5 minutes, then swallow 1-2 times a day. Throat Health: Hold 2 tablespoons of liquid silver in mouth for 3 minutes then swallow, Repeat several times a day. If using spray, use 15 sprays every other hour. Lung Health: Swallow 2 tablespoons 2-3 times a day, and inhale 4 sprays four times a day. Ear Health: Point ear towards the sky and fill ear canal with liquid silver, and hold for 10 minutes. Repeat every 12 hours. And swallow 2 teaspoons of liquid silver twice daily. • Eye Health: Use liquid silver drops or spray every hour, or as needed. Nasal Health / Allergies: Swallow 2 teaspoons (liquid silver) twice daily and spray liquid silver into the nose 3-4 sprays 1- 4 times a day. Use a cool mist humidifier or nebulizer and fill the reservoir one tenth full with liquid silver the fill the rest with water and place it next to bed during sleep. To support the immune system, swallow 2 teaspoons twice a day and wash spray or wet napkin wounds, or apply to bandages and apply topically as needed. Skin Health: To support the immune system, apply with wet napkin twice daily or as needed, and swallow liquid silver 2 teaspoons twice daily. • Nail health: Apply liquid by soaking, rinsing, wet napkin or in a cotton as needed. Pour 2 tablespoons of liquid silver per gallon into water wait 4 minutes drink as needed. For smaller doses; pour 4 drops into 8 ounces of water and wait 1.4 minutes. Swallow 2 teaspoons before, during and after flying or driving, for general immune support. Hold under tongue for 30 seconds before swallowing. And spray 3-4 sprays of liquid silver into nose before flying. A healthy alternative drink for an active life. ZING is a superior energy source that provides both instant and highly sustainable energy lasting for hours without causing the jitters and inevitable crash experienced with most energy drinks. ZING is a safe and healthy alternative to carbonated beverages filled with artificial sugar and caffeine. ZING is a powerful formulation of concentrated extracts designed to revitalize energy and heighten mental acuity. Fortified with essential vitamins, critical amino acids, oxygenating enzymes and energy boosting extracts, ZING provides the fuel your body craves for optimal performance.* . ZING contains fortifying ingredient including Protein, Vitamins C, B12, B3, Vitamin 6, Coenzyme Q-10, Green Tea Extract, Guarana Extract (Natural Caffeine), Lo Han Guo, Panax Ginseng Root, Taurine, Reshi, Jiaogulan, Cordyceps, Rhodiola Rosea, Natural Sweetners Levulose and Stevia Leaf. Mix 1 scoop of ZING with 8 ounces of water as needed. Dissolves instantly. Recommended use is no more than three servings per day.